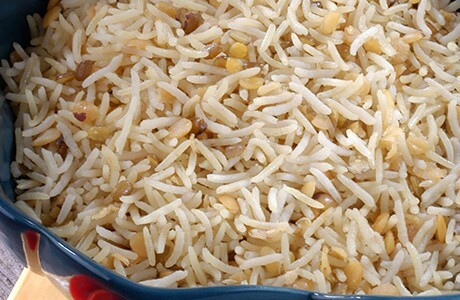 Light, fluffy Basmati is filled with delicious lentils and a mix of fragrant turmeric, hot chili powder, as well as fresh ginger, making it perfect for vegetarians. Heat the refined oil in a deep pan; add the green gram, lentil, split red gram, and Bengal gram; stir to mix well. Reduce heat and stir-fry for 5-7 minutes. Add 1 cup water and bring to the boil. Cook until the mixture is tender. Add the salt, turmeric powder, red chilli powder ginger and garlic pastes; mix well. Add the drained rice and stir to mix well with the cooked grams. Add 3½ cups water and bring to the boil. Reduce heat and cook until the rice is tender and the water is absorbed. Cover with a tight lid and keep in a preheated oven (170°C / 325°F) for 10 minutes.